So I found this nifty website where you can take pictures and generate an average face. The reason this is interesting is, there is a theory that human beauty has some universal roots.. that the more average your features are to (the distance between such things as your nose, eyes etc...) the more attractive you are perceived to be. Here is a link to the Face Averaging program that I used above As you can see in the picture above, I selected all the female samples and hit the 'View Average' button. 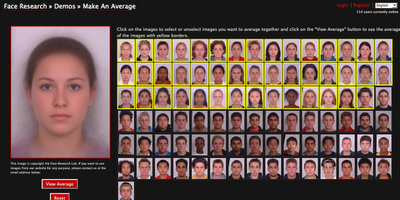 This generates a composite image based on the average facial features of all of the selected subjects. The idea behind this can be somewhat explained through evolutionary biology. The idea that facial symmetry and clear skin are 'honest' indicators of health. So basically if you have massive asymmetry (your eye is like 1 inch lower than it should be on one side) then it perhaps implies that you have some mutation load. So the more inline with what is average in terms of facial symmetry and distance between key facial features the better. This is all theory of course but it is quite interesting. Anyhow check out this video below for some more information about a program that automatically beautifies a picture... its kind of scary and cool at the same time. This would be great for marketing plastic surgery, if you set things like eye socket spacing and other hard to modify things as constant. So when a client comes in, you could literally be like, well here is a possible face mod for you. Update: Thought of the day!